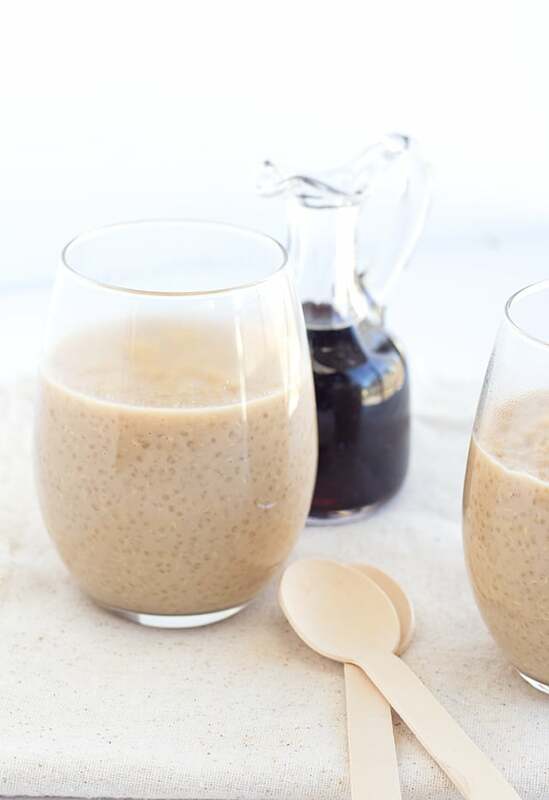 Welcome to another month of the peanut butter bash with this maple peanut butter quinoa pudding. Thanks to Minute® Ready to Serve Rice for sponsoring this quinoa portion of this recipe! 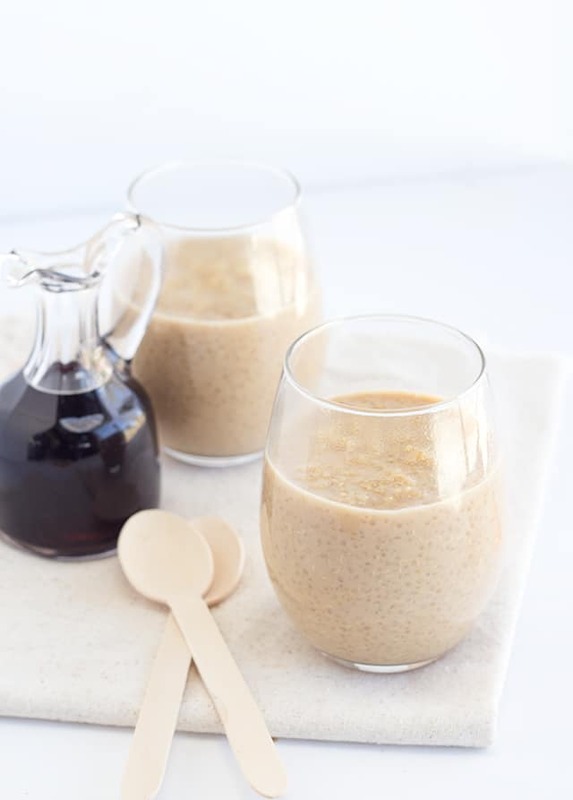 This month’s theme was peanut butter and quinoa to get the year started out right. I thought I would share a nutritious recipe. The peanut butter adds most lovely creamy texture. The quinoa adds a nice pop with every bite. The maple flavor pairs perfectly with the peanut butter. Oh, and the brown sugar brings the sweetness that I need in all my recipes. This is more of a dessert rather than breakfast, just so you’re warned. This recipe reminds me of grits with butter and brown sugar. It’s one of my very favorite things to eat. This is right up there. I feel like this recipe has more liquid and creamier. I also think it’s a ton healthier than the grits. I’m seriously thinking about making my grits for the blog now. Mostly because I need a reason to make it and be able to eat it. Just in case you missed my saltine candy post where I declare I’m back to the fight to being thin, that’s the news. Not because I made it my resolution, but because my pants are pinching me in places I don’t prefer to be pinched in. You feel me? I initially made this recipe by first cooking the quinoa. I didn’t mind it because I’m a lover of food and being in the kitchen. I have found a shortcut to cut down the cooking time for my impatient readers using Minute® Ready to Serve Rice brown rice and quinoa. If you use this way rather than cooking your own quinoa, you’ll have red quinoa in your pudding. Man, it is nice to be able to cut down on time when you’re in a little bit of a hurry. These ready to serve cups of brown rice and quinoa are awesome for on-the-go especially with the kiddies heading back to school. Just the other day I heated up one of the brown & wild rice cups and ate it with a bunch of veggies, worcestershire sauce and hot sauce for lunch. These little cups are perfect to add with a few mix-ins like veggies, sauces, or cheese. Did I mention it was thrown together in minutes and I didn’t have to dirty another dish! I ate it out of the cup! Anything that can be ate out of the container it comes in and saves me from doing a dish is a winner in my book. They also have a ton of different varieties to pick from. They have Brown & Quinoa, Basmati Rice, as well as Whole Grain options of Brown Rice, Brown & Wild Rice and Multi-Grain Medley. The only ones I haven’t had yet is the basmati rice and plain brown rice. 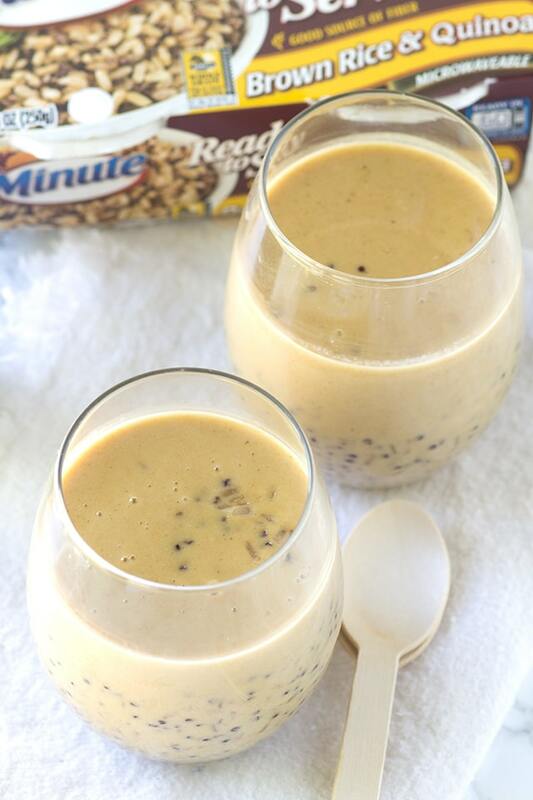 In a large saucepan, add in the Minute® Ready to Serve Rice Brown Rice & Quinoa, milk and brown sugar. Turn the heat to medium and let simmer for 30 minutes until the mixture becomes thick. When you run a wooden spoon down the middle of the bottom of the saucepan, the quinoa mixture should be thick enough to separate for a brief second. Once the quinoa has thickened, add in the peanut butter and maple. Stir until combined. Let cook for an additional 10 minutes. Remove from the heat and let set for 10 minutes. It will still be plenty warm and have time to thicken a bit more. Scoop into bowl or cup and serve. If using regular quinoa instead of the ready to serve, use these measurements and instructions. In a large saucepan, add in the uncooked quinoa and water. Let the water come up to a boil. Reduce to simmer and cover the saucepan. Cook until the water is absorbed. This took about 20 - 25 minutes or until water is absorbed. We’ve had so many readers want to join us that we’ve started a peanut butter sharing group for all! Join us at The Peanut Butter Recipe Box Facebook Group! Bloggers, do you want to join in on the peanut butter bash fun? If so, email me at [email protected] and request to join the Peanut Butter Bash facebook group! The first Thursday of each month we post a dessert/sweet with peanut butter and a mystery ingredient. This month’s ingredients were peanut butter and quinoa. 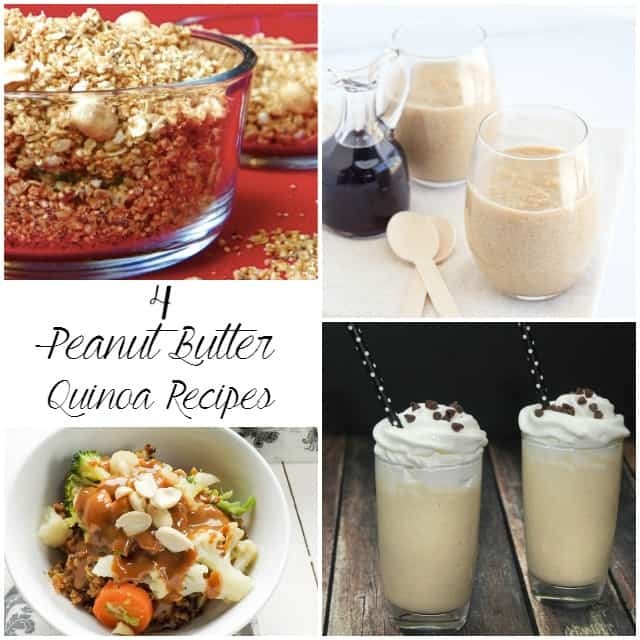 Here are the other peanut butter and quinoa creations! This is SUCH a good idea, Miranda! 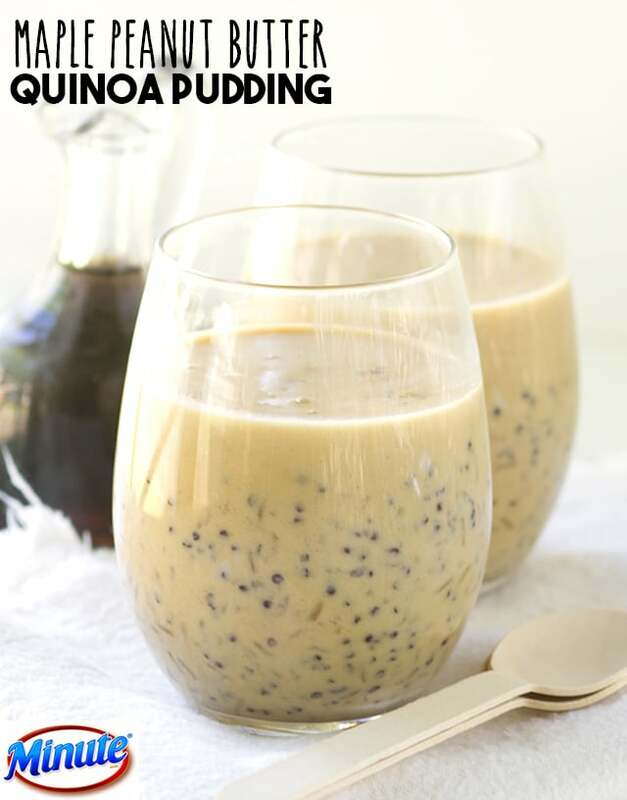 I would never have thought to make a quinoa pudding! It reminds me a lot of chia seed pudding. I cannot wait to try this recipe! It looks delicious and filling, and the photos are beautiful. 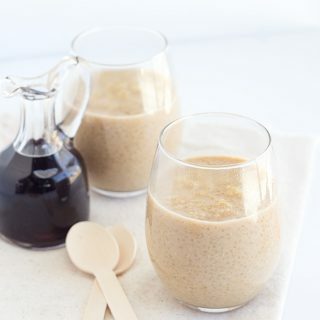 Could I use a bit of maple syrup instead of maple extract (or vanilla extract instead)? Also, my pants are also getting tight, but I tell myself that it’s winter so it’s okay if I eat an extra cookie or piece of chocolate. My pants will fit better in the spring, haha. It’s a good resolution, though! Thanks again for the awesome recipe! I’ve never seen anything like this! 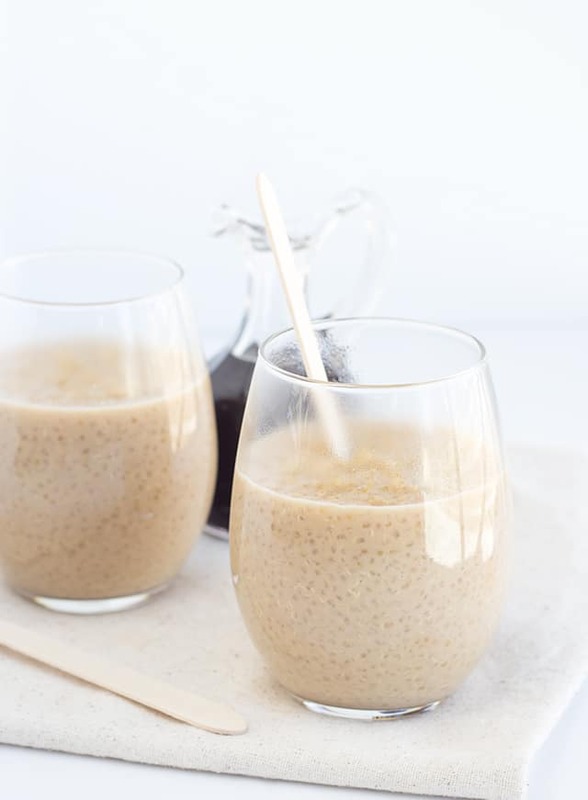 Wow I love this idea for using quinoa, I will have to try it! My kids love grits and they love peanut butter. I’m betting they would devour this. I can’t wait to try it!